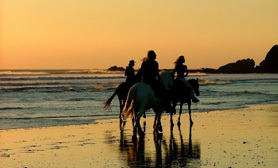 Your Ixtapa horseback riding adventure starts as soon as our guide picks you up from the cruise ship port and takes you to Rancho El Palmar, where you’ll be paired with a horse that suits your riding skills. Designed for both beginners and experienced riders, this Zihuatanejo Ixtapa horseback riding shore excursion is exciting and fun activity for all, including children! The ride consists of two-hour ride along the beach then through the tropical jungle. Riding through coconut groves and small huts tucked beneath the trees, towering coconut palms with mango and banana trees growing under them. We leave the forest and onto Playa Larga, which means “long beach.” Ride along the 9.5 miles (15km) of unspoiled beach lined with palm trees, and savor the picturesque view of Zihuatanejo Bay.